The St. Stephen's PreKindergarten program provides a nurturing environment that encourages children to view themselves as competent independent learners. We offer a developmentally appropriate program for 3 and 4 year olds focusing on the growth of the whole child: academically, spiritually, morally, and physically. We understand each child is a unique person with an individual learning style. The curriculum for our PreK3s and PreK4s is experiential in nature and is delivered through whole group instruction and well-designed centers. Opportunities for developing readiness skills in language arts and mathematics, as well as in science and social studies, foster excitement in learning through individual and small group experiences. Technology is introduced through use of iPads in the learning centers, including use of the OSMO system to explore elemental coding, music, and math. Three strands of the St. Stephen’s curriculum begin in PreK3 and extend through Second Grade and beyond – ZooPhonics, Handwriting Without Tears (focused on fine motor skill development in PreK), and Everyday Mathematics. Ample time for indoor and outdoor play with appropriate early childhood equipment and with peers allows the children to develop a kind and loving attitude towards others. There is a commitment to outdoor learning opportunities, and arts and crafts projects enhance fine motor skills as well as a sense of accomplishment. The weekly activities are enriched through experiences with specials teachers in studio art, music, spiritual formation, and physical education (focused on gross motor development). St. Stephen's seeks to provide a challenging academic curriculum for students in Kindergarten through Sixth Grade while maintaining the flexibility to meet the needs of each student. We believe that to be effective, education must be founded on secure mastery of basic skills, taught not only in isolation but also in integration with one another. We place strong emphasis on reading, personal expression of ideas through speaking and writing, and the mastery of computational and problem solving skills. We also encourage critical thinking and scientific exploration, artistic creativity, and physical activity. Our high expectations for academic achievement are balanced with development of a broader sense of the world and the importance of service to others. The core subjects of language arts, mathematics, science, and social studies form the foundation of the St. Stephen's experience. This traditional curriculum utilizes technology to engage students, and it is enriched with music, studio art, spiritual formation, and daily physical education classes for Kindergarten through Sixth Grade. Our 1:1 iPad program includes Third through Sixth Grade students who are assigned an iPad for their classroom and home use. PreK3 through Second Grade utilize iPads in learning centers/stations. In Grades 3 – 6, educational applications on the iPads are utilized for research, writing, math, science, and presentations. In the younger grades apps are focused on reading, math, and coding. At St. Stephen’s each child is known and loved for their individual strengths. Our campus offers varied experiential opportunities for students to explore these strengths whether in the science lab, outside on the nature trail or on the archery range. It is our belief that, as our students are known and challenged with love, they soar! Core subjects are designed to promote mastery of essential skills and concepts. Beyond its core curriculum, St. Stephen's includes studio art, music, technology, daily physical education, outdoor learning, and chapel services. The St. Stephen's program is enhanced by a campus that includes a fully equipped science lab, library, Chapel, main Church, the Jack Johnson Gymnasium, three playgrounds, a playing field, a discovery garden and outdoor classroom, a nature trail and an outdoor chapel. The strong balance between academic approaches and experiential learning creates self-confident students able to solve problems and think creatively. St. Stephen's Episcopal School recognizes that each child is an individual and gears teaching strategies to ensure that students will experience success at their level of learning. St. Stephen's creates a supportive learning environment that responds to learners' needs through a variety of materials, technology, and methods, including differentiation and flexible grouping. Grades 1 – 6 are mixed age group classes, i.e. 1st/2nd; 3rd/4th; and 5th/6th. Students are challenged to set higher goals and rise to higher achievement as their individual gifts and talents are discovered and developed. In an effort to acknowledge various levels of academic ability, social development, and learning styles, while engaging all learners, St. Stephen's provides active and in-depth learning through curriculum integration. This interdisciplinary curriculum approach allows a common framework to facilitate connections across disciplines. This method helps students relate information from various content areas, connecting learning to real life, and making teaching and learning more meaningful. 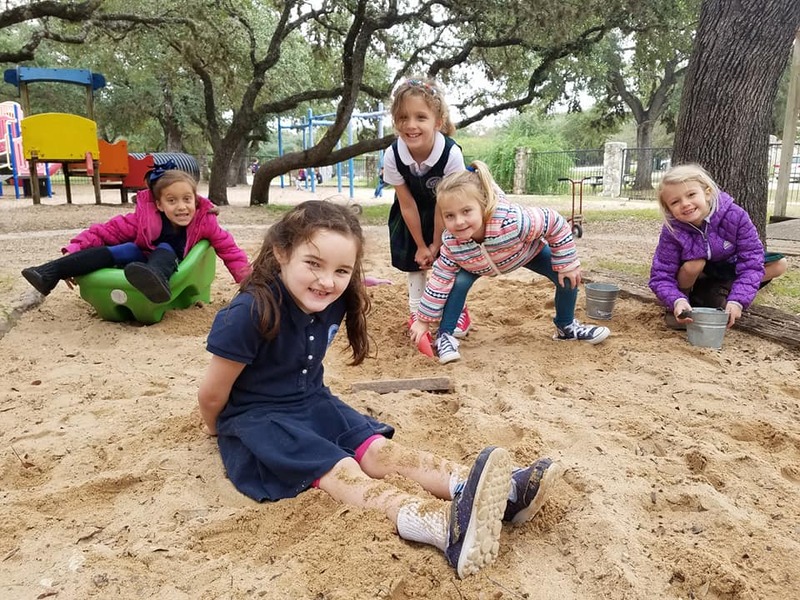 PreK students, based on being a 3-day or 5-day student, have chapel, music, studio art and physical education once or twice a week and spiritual formation once a week. Students in Kindergarten through Sixth Grade have physical education daily, chapel two or three times a week, music and studio art twice a week, and spiritual formation once a week. Beginning in First Grade, students have archery instruction in PE. St. Stephen's won the Texas Elementary National Archery in Schools Championship in 2014. Outdoor Education. This is a holistic and experiential approach to learning that includes various day and overnight trips, special programs brought in from outside sources, and use of resources on campus, including the discovery garden and outdoor classroom, the 1.3 mile nature trail, the labyrinth, and the native prairie preserve. STEAM. St. Stephen's includes the Arts in its Science, Technology, Engineering, and Mathematics initiatives to create STEAM. This is an integrated, active, real-world problem-solving curriculum approach which encourages students to be more creative and collaborative. The iPad is a valuable tool for exploration and discovery and is used across subject areas as part of the STEAM initiative. St. Stephen’s teaches Lego Mindstorm robotics and coding in Grades 3 – 6 and utilizes Wonder Workshop’s Dot and Dash program to teach coding to PreK4 – 2nd Grade students. PreK3 and PreK4 students also utilize OSMO with iPads in centers to explore elemental coding, music, and math. Morning Listening Program & Kodály Music Concept and Dancing Drum® “Drumming Up Character!" Program. Each day at St. Stephen's begins with Music in the Morning, a selection of classical music that is played for the entire school to hear and then briefly discussed by our faculty music instructor. It is followed by recitation of the Pledge of Allegiance, the School Creed, and the scripture of the week. Much of St. Stephen's music program is based on the Kodály Concept, an American adaptation of the Hungarian method developed by Zoltan Kodály. This pre-literacy method stresses singing, as the voice is the most natural and universal instrument. Students also utilize classroom percussion/Orf instruments and become acquainted with the piano keyboard and the recorder. St. Stephen’s also utilizes an innovative, cross-curricular African drum musical program by Dancing Drum®-Drumming Up Character!" The program combines an introduction to percussion, character lessons, and African culture learned on authentic African drums. Classes present various musical programs during the year along with an annual Christmas Pageant. Extracurricular Programs. St. Stephen's Episcopal School offers after school extracurricular courses each semester for an additional fee. Opportunities vary each semester and have included courses such as science adventures, studio art, kids in the kitchen, guitar instruction, theater, archery, robotics, coding, and soccer. St. Stephen's has developed a nationally recognized archery program that begins with instruction in PE class for First through Sixth Grades and is extended through extracurricular course offerings. There is also choir offered after school through a program sponsored by St. Stephen's Church. Melody Makers for Kinder through Second Grade, and Celebration Singers for Third through Sixth Grades is open to the church and school community at no charge. All of these programs illustrate the School's commitment to experiential learning and the development of skills and teamwork.